A fitting War Memorial for those brave men and women who living in Exmouth and lost their lives fighting for freedom. 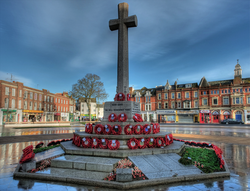 In the very heart of Exmouth town centre is a fitting tribute, a grade 2 listed War Memorial to Remember all those who lived in Exmouth and lost their lives in every conflict from World War 1 through to the current conflict in the Middle East. We where honoured when Lionel Howell asked us to produce the Panels which surround the War Memorial and have over 200 names of those brave Men and Women who fought for our freedom. We happily produced the lettering at a reduced cost due to its cause and being a local stonemason it was our honour and privilege.